Breakfast crepes reek of luxury… we had amazing buckwheat crepes in Paris three years ago. Before we even stepped into the restaurant we were hit with the smell of a wall of sizzling butter. 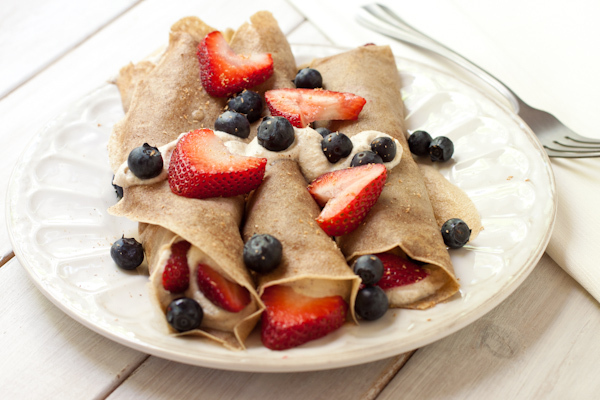 Those crepes, made only with buckwheat, are a Breton specialty and naturally gluten-free. These are a tad less buttery, but still rich and satisfying. I adapted the crepes recipe from Gluten-Free Baking For Dummies , then created my own vanilla ricotta cream using a new stevia I am testing: Pyure. I like this organic stevia a lot… very little aftertaste and I only needed to use two packets to sweeten an entire carton of ricotta. 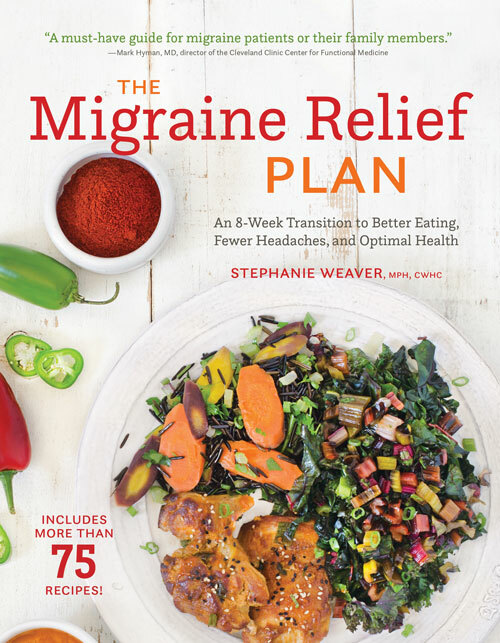 They start with organic stevia, derived from the sweetest part of the plant, and then blend it with organic agave inulin fiber, a probiotic and digestive aid. Their website states it’s suitable for diabetics. I used a variety of gluten-free flours: sweet sorghum, tapioca, brown rice, and teff, and blended them in the Vitamix to ensure a fine consistency. If you have a high-speed blender you can throw the teff seeds in whole; it easily turns them into flour without an extra step. Making the batter in the blender allows you to reblend it briefly before pouring each crepe, as this batter tends to settle and separate. Since there is no salt or leavening, these are naturally low in sodium (the sodium primarily comes from the egg whites). I sweeten the whole-milk ricotta with a little stevia, homemade vanilla extract, seeds from two vanilla beans that have been in the extract a while, Vietnamese cinnamon, and freshly grated nutmeg. Then all you need to add is fresh berries. Read the labels on the ricotta as the sodium content varies widely. Galbani Precious whole-milk ricotta has only 60 mg per half cup. To make these even easier, scoop the ricotta cream into a zip-top bag, close, and snip off a small corner when you are ready to plate. Instant piping bag! Freeze the extra crepes; they make great wraps or can be used for a savory dinner crepe. 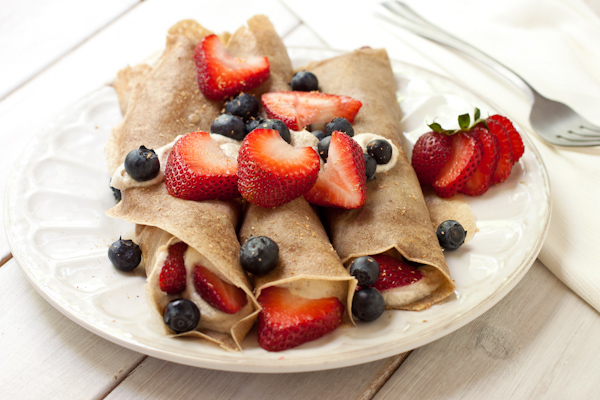 Make-ahead crepes filled with vanilla ricotta cream and fresh berries. Put the first four ingredients in the blender and blend until a fine powder. Add milk, water, and eggs and blend for one minute. Let stand at least 20 minutes, 30 is better. Melt the butter and blend in just before cooking the crepes. Heat a non-stick large skillet or frying pan over medium heat. No oil is needed; there is enough in the batter. Pulse once or twice to remix, each time, before pouring 1/4 cup of batter into the center of the pan, tilting it in a circle to spread the batter into a thin circle. Cook two minutes until just set, then flip with a spatula or tongs, and cook another 30 seconds. Remove to a plate, then pour the next crepe. I fill the ones we are going to eat while each is cooking, putting them on another plate. Stuff with ricotta cream and berries. 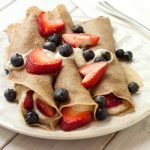 Cool extra crepes on separate plates (they stick together), then stack, separated by waxed paper, and wrap with plastic wrap, in a heavy freezer-safe bag to freeze. They are also great for dinner. Mix together in a bowl, then replace back in the tub for storage. Eat within four days. To fill crepes, put into a zip-top bag, close, then snip off a corner and use it to pipe the cream into each crepe. Crepe recipe adapted from Gluten-Free Baking for Dummies. Commonly I would not study document with blogs, but I want to declare that that write-up pretty urged us to undertake so! Your current writing style has been pleasantly surprised us. Thank you, extremely excellent post. What’s not to love about a dessert appropriate for breakfast? Looks delish. Looks great Stephanie! I’ve never made crÃªpes before :/ I need to get on that. I am amazed you have never made them before. They are really easy, except for the swirling part. I have a big square nonstick electric frying pan that I use… I’m sure a non-stick crepe pan would work better, but I don’t have room for specialty pans. These are beautiful and what a great pic. At a lot of the farmer’s markets they have gluten free buckwheat crepes which are really good too. Thanks Liz. I was actually attending an online food photography class while I cooked and shot these, and hopefully I learned some things that helped the shot! Thanks Maggie, I appreciate the comment and the share on Twitter! Nice to meet you!